The more I think about this production, the better I like it. And, I left the theater damn happy to begin with! 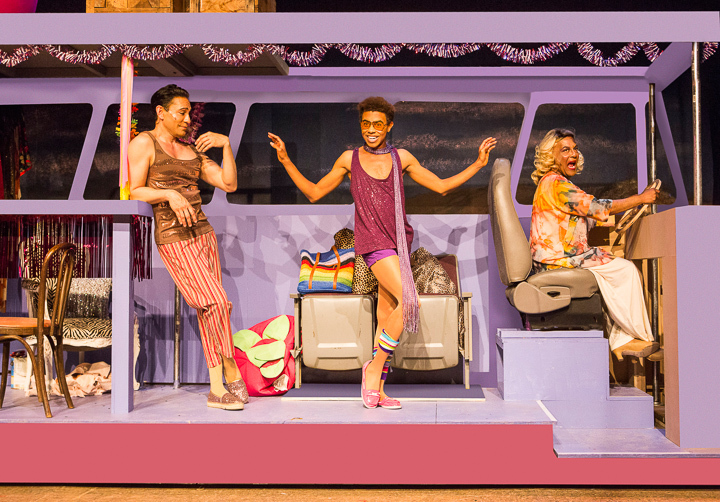 The musical Priscilla follows the basic story of the original movie and adds in about every disco/pop hit of the late 70’s and 80’s in a supremely fun, colorful, and fast moving montage that makes the 2 1/2 hours running time go too quickly. Theatre Rhinoceros executes perfectly. There’s pop, acting, razzle-dazzle, music, and emotion. The singing is good++, the choreography spectacular, and the staging top notch. There is a surplus of enthusiasm and good feeling, and that glow gets us focusing on the positives and ignoring imperfections. So, the costumes are eye-catching (if not perfectly fitted). 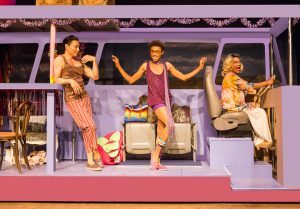 The huge cast of 14 (plus three alternating youngsters who share the role of Benji) has strong acting and musical ability. You’re treated to a engaging show, not just a campy, over-the-top extravaganza. Each actor successfully walks the tightrope that keeps them entertaining and in character while NOT falling into farce or tawdry caricature. The main characters, divas, minor characters, … everyone! has spotlight moments and makes the most of them. Okay, there’s a minor character or two who were “enthusiastic”, but that attitude and at least moderate ability just made the show more Priscilla-like to me. Minorly flawed, but damn happy, 100%-effort is how Priscilla should be presented, in my world. In fact, when I heard of how glitzy the New York production was, I felt that we were seeing a better version. Priscilla is about a pick-up drag show in the out Outback of Australia. Production values are not what’s important. In New York there was a major tour bus on stage, apparently. At the Rhino we had a big, fun prop bus that was a better Priscilla than any modern metal Greyhound monstrosity would be. In New York they changed the road signs from “Kangaroos Ahead” or “Wombat Crossing” to things like “Deer Crossing”. That’s what I was told, anyway. Overall, the Rhino production felt right. It was absolutely entertaining. It made me grin insanely, clap along, and root for our hero, heroine, and even the obnoxious foil. There were show-stopping moments (how did they do that pingpong ball scene?) and masterclass scenes. I wouldn’t have wanted them to change anything. There was a perfection in this performance that embraced its slight imperfections. Thank you, Theatre Rhinoceros for putting together this production! This entry was posted in plays and tagged 5 stars, Priscilla, Theatre Rhino. Bookmark the permalink.